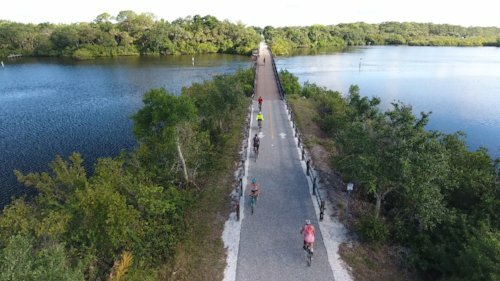 With less than a week to go before voters make a $65-million decision on the future of The Legacy Trail, members of a nonprofit advocacy group for the Sarasota County attraction are continuing to add contributions to their Square Foot Campaign in support of the trail’s North Extension. Launched late last year, the Square Foot Campaign — as its name implies — allows a person to “pay for” a specific square foot of the first phase of the North Extension. 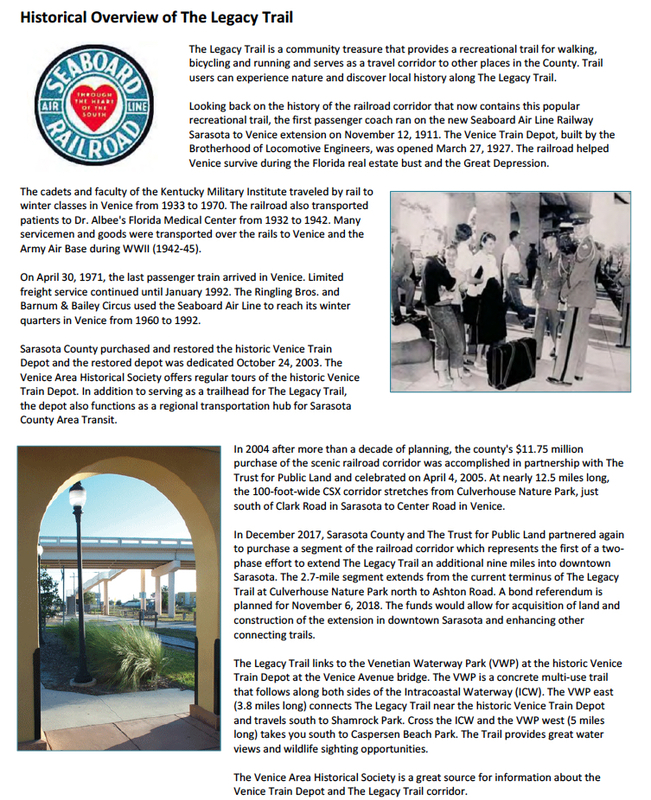 On Dec. 20, 2017, the Trust for Public Land and Sarasota County announced the county’s purchase of 2.7 miles of former railroad right of way to extend The Legacy Trail north toward downtown Sarasota’s Payne Park. The Trust had acquired the property from CSX Transportation and CSX’s lessee, Seminole Gulf Railway. The Phase I segment runs from Culverhouse Nature Park on Palmer Ranch to Ashton Road. The development of the final 6.3-mile segment, from Ashton Road to Fruitville Road in Sarasota, is contingent upon voters’ approval of a referendum the Sarasota County Commission voted in March to place on the Nov. 6 General Election ballot. 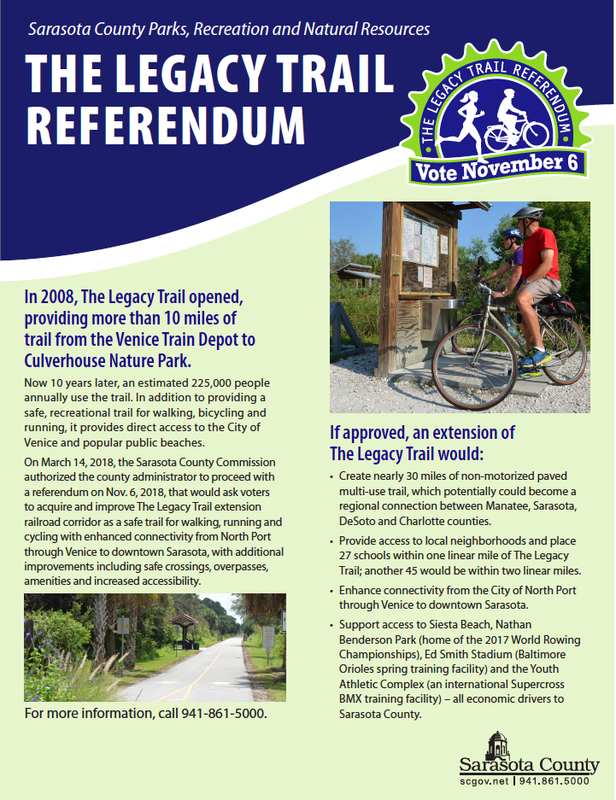 With the heading Sarasota County General Obligation Bonds for Legacy Trail Extension with Enhanced Safety and Connections, the ballot question asks voters if they will approve the county’s issuance of bonds up to $65 million, to be paid off by an increase in property taxes over 20 years. If the voters approve the referendum, the first bonds, for $35 million, are expected to be issued in 2019. They would cover the expense of purchasing the segment from Ashton to Fruitville from CSX and Seminole Gulf Railway, as well as the design, engineering and connections to North Port and Venice. A second bond issue would come in 2020, Carolyn Brown, then director of the county’s Parks, Recreation and Natural Resources Department, told the commissioners on March 14. The county’s Office of Financial Management, Brown said, had provided figures for the amount of additional property taxes the owner of a $200,000 home would pay, if those bonds are issued. The homeowner would see an increase of $9 on the November 2019 tax bill, Brown continued; that would rise to $16 from 2021 through 2039, and then it would drop to $7 in 2040. “We have found that people are very enthusiastic,” Martin said of the Friends of The Legacy Trail’s efforts to garner support for the referendum. As members of the nonprofit have pointed out, an estimated 225,000 people annually use the trail. 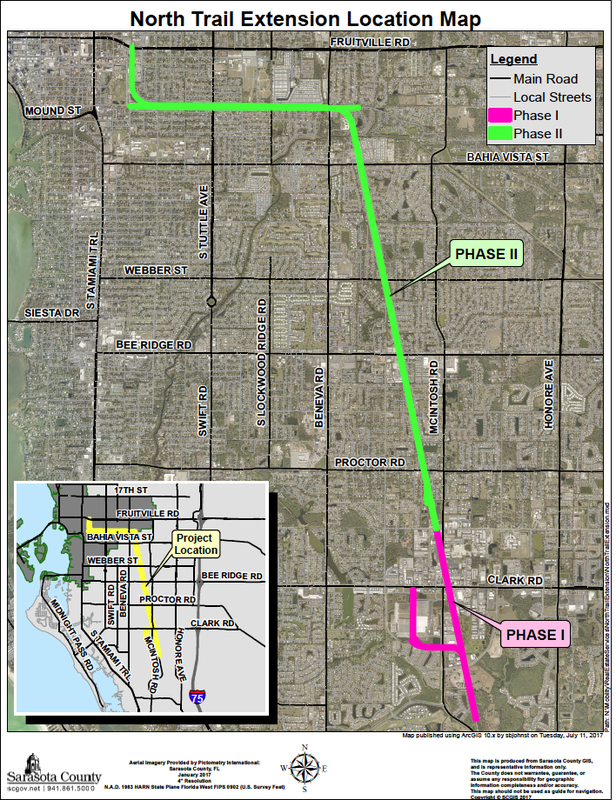 If the final links are created to provide connectivity from North Port through Venice to downtown Sarasota, bicyclists, walkers and runners will have “nearly 30 miles of non-motorized paved multi-use trail, which potentially could become a regional connection between Manatee, Sarasota, DeSoto and Charlotte counties,” a Sarasota County fact sheet explains. The advocacy has been an enjoyable experience and a less emotional one than a typical political campaign, he pointed out, because of that focus on education. 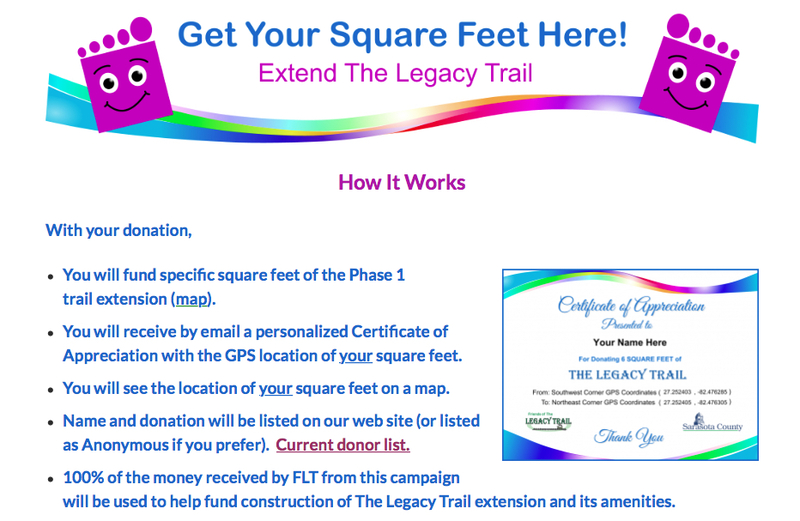 On its website, the Friends of The Legacy Trail (FLT) has kept a running tally of support for its Square Foot Campaign. As of Nov. 1, the total was $57,107 from 531 donations, the website said. “Your donation will fund specific square feet of the trail extension. • “You will see the location of your square feet on a map. Friends of The Legacy Trail is a nonprofit group that represents about 1,000 members, it noted in its news release. It has no paid staff. Along with the funds the campaign has raised, Martin said the organization has been delighted with the endorsements for the bond referendum, as well as letters advocates have sent to area publications. He also noted the Sarasota County fact sheet, created by county staff at the behest of the County Commission, in an effort to explain the background of the referendum. “The county has done a good job of educating people,” Martin told the News Leader. The county also has been publicizing the referendum on its website and on its Twitter account and Facebook page, just as the Friends of The Legacy Trail has used social media to spread the word, Martin noted. The nonprofit has added Instagram into its mix, as well.